As soon as I read the blurb on the book jacket, I knew I was going to enjoy reading Daring Greatly, by Brene Brown. Based on twelve years of pioneering research, Dr. Brene Brown dispels the cultural myth that vulnerability is weakness and argues that it is, in truth, our most accurate measure of courage. 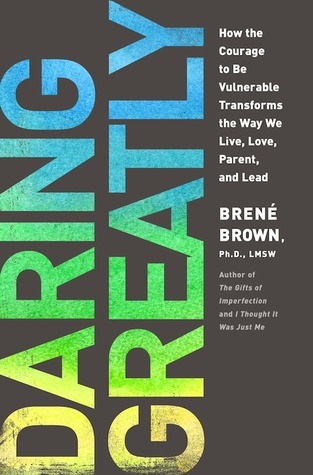 The full title of Brown’s book is Daring Greatly: How the Courage to Be Vulnerable Transforms the Way We Live, Love, Parent, and Lead. At the end of the book are two chapters specifically for leaders and parents. However, don’t be misled by the term “leaders.” In some area of your life, you are a leader. Brown writes that Chapter 6 is “for all of us–parents, teachers, community volunteers, and CEOs–anyone who is willing to dare greatly and lead.” I also think that Chapter 7, “Wholehearted Parenting: Daring to Be the Adults We Want Our Children to Be” is useful to more than just parents, but to anyone who is an important adult figure in a child’s life. And if you think this book is just for women, think again! Brown’s whole section on how men perceive shame and vulnerability was eye-opening for me. Even more eye-popping was the revelation that while women want men to be vulnerable and open, when men actually ARE vulnerable, their vulnerability makes women uncomfortable! What a catch 22! As I read through this book, I underlined and dog-eared so many phrases and pages that spoke to me. Not only does Brown use her research to back up her writing, she uses personal stories, which in turn makes her vulnerable. She not only advocates us to be vulnerable, she practices what she preaches. She writes, “My kitchen-table self is too messy, too imperfect, too unpredictable.” And then she goes on to tell us all about her kitchen-table self. Reading Daring Greatly is like sitting at the kitchen table with your best friend and chatting over a cup of coffee. It’s an honest read that warms your soul, dares you to cast aside the myth that being vulnerable is being weak, and to know that yes, you are enough. Join the Daring Greatly discussion at BlogHer Book Club! You know, I was a big Brene Brown fan after she did her first TED talk, but I've found that she's gone too "hollywood-like" for me as of recent! (I know, probably just me). I should just bite the bullet and get her book. I've heard its a good read! It was very thought-provoking. I liked what the author had to say! This is the second post I've read about this book and I'm interested in buying it now! Thanks! I'm usually not into self-help books, but this was a really good one!